The actor Iwai Hanshirô VII held the name of Iwai Shijaku I from the 11th lunar month of 1822 to the 2nd lunar month of 1844. The actor Iwai Hanshirô VIII held the name of Iwai Shijaku II from the 2nd lunar month of 1864 to the 1st lunar month of 1872. Born in Ôsaka in 1840. He started his career as a disciple of Arashi San'emon X, who gave him the name of Arashi Eizaburô. he spent his prime in Ôsaka either in miyaji shibai or in hama shibai. 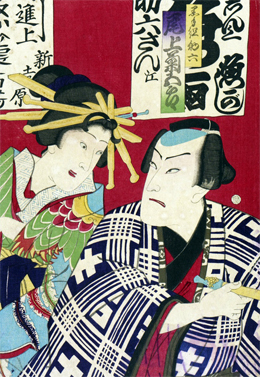 He went to Edo in 1867, travelling with Arashi Rikaku III and Ichikawa Aragorô III. 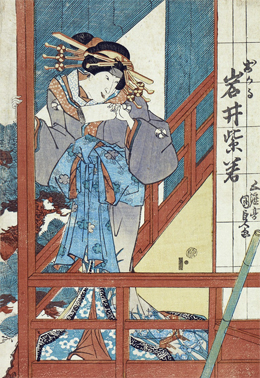 He was presented to the Edo audience at the Nakamuraza in the 2nd lunar month [print]. He became the adopted son of Iwai Shijaku II in 1870. 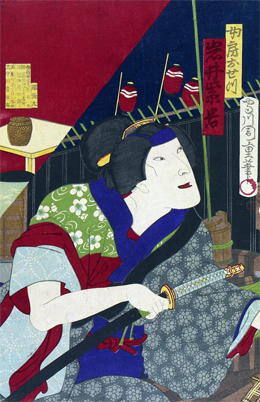 He took the name of Iwai Shijaku III in the 2nd lunar month of 1872 at the Nakamuraza, playing in the drama "Yayoi Zakura Shiranui Monogatari". 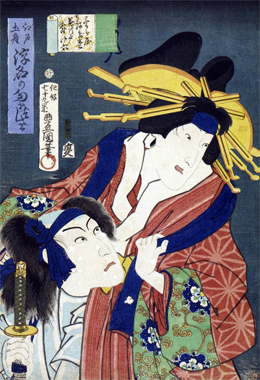 He was a promising actor, excelling in wakashugata roles, but died too young, the 5th of October 1873. Iwai Shijaku V, the granddaughter of Iwai Kumesaburô V, is not a Kabuki actor but a dance master of the Iwai school of dance (Buyô), a school created by her grandfather [more details (in japanese)]. She took this name in 1946.